So Canberra has this long-suffering burger van called Brodburger. 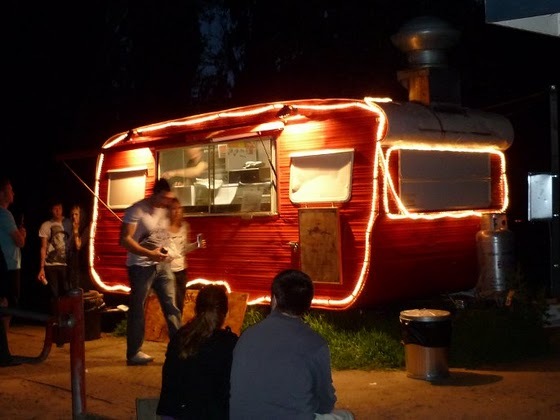 It’s a little red number, decked out with fairy lights like a gypsy caravan, and it sits down by the lake offering some of the best food-from-a-van anywhere in the world. The van started business in March 2009, and exploded in popularity. You’d think the good people of Canberra had never seen a burger before. Yet while still on the up and up, at the end of the year, Brodburger was advised that their hawker’s license would not be renewed, and was asked to vacate the site by the 1st of June 2010. The situation is a bit of a mess, as the van exists in a park that is managed by the ACT Governement, which is on land that is run by the National Capital Authority (NCA). Territory and Municiple Services said yes, NCA said no. No one quite knows what the other is doing, meanwhile huge queues of of Canberran’s were devastated about the business’ impending demise, eating every burger like it could be their last, lines wrapping right around the adjacent car park. Sadly, a large part of the NCA’s issue with the van comes down to ‘keeping up appearances’ in the most literal sense. Everything in Canberra, and particularly aside the lake, is planned within an inch of its life (the ACT Government is no better, having in recent times asked a local inner city record store to move their CD racks back inside the shop ‘for tidiness of appearance’, and suggesting that cafe furniture that sits outdoors should be subject to approval.) Reading about the NCA on their own website, one gets the sense that they do have Canberra’s best interests at heart, yet when the boat is rocked and the pressure is on, they all too easily seem to take on the guise of the fun police, clutching and pointing frantically at the Walter Burley Griffin plan. Again. As it happens little red burger vans were not part of his vision. The popular Brodburger takeaway venture will relocate to the Canberra Glassworks later this year after the ACT Government brokered an arrangement that will add character and visitors to the Kingston Foreshore arts precinct, ACT Minister for Arts Joy Burch announced today. Ms Burch said the ACT Government has been working with the Brodburger operators and the Canberra Glassworks for several months to accommodate the popular takeaway business at the Glassworks, which has been looking to secure a long-term tenant for its cafe. The new Arts Minister met Brodburger owners Sascha Brodbeck and Joelle Bou-Jaoude and Canberra Glassworks Chief Executive Anne Jakle yesterday to confirm the ACT Government would work with the two parties to jointly fund a retrofit of the Glassworks’ cafeteria area to accommodate Brodburger. “Brodburger currently operates from a caravan in Bowen Park under a temporary agreement with the National Capital Authority and has been looking for a permanent home, so this really is a win-win for everyone,” Ms Burch said. Upon initially reading this I was pleased that a there was light at the end of this frustrating bureaucratic tunnel. Yet as I thought about it, the idea of putting such a wildly, gangbustingly popular establishment within a publicly funded arts organisation made me feel a bit uneasy. Of course, the Glassworks was designed with a cafe space – there was always the intent that the cafe fed and watered the visitors to the Glassworks itself. Now, if the overwhelming popularity of Brodburger continues following their relocation, or even if it diminishes slightly, the realtionship will be turned on its head. Will all these burger buyers decide to take a look at an exhibition while they are there? Watch some studio glass making? Buy something from the Glasswork’s shop? If so, all the better. But if they come for burgers and leave – will they still be counted as Glasswork’s audience? It’s not unusual for an art institution to boast a popular dining establishment – the National Portrait Gallery being but one example. But at what point does this become the main focus and the instiution becomes simply a decorative home in which to eat? And what does it mean when that institution is asked (as they are) to measure their own success? Brilliantly put Yolande. I think its time for Canberra’s real people to rise up against the tyrannical NCA and demand the quality hamburgers that others across Australia enjoy. The NCA will not understand this terribly obscure metaphor but its all about generating an environment that reflects life and activity. Was it Walter Burley Griffin’s vision to create a town devoid of humanity ? The caravan is the tip of the NCA’s bleak interpretation of Burley Griffin’s plan. It has succeeded only in producing an urban environment of breathtaking sterility. A capital the whole nation can sneer at – has this escaped their attention? Notwithstanding the Floriade side show, Canberra’s Spring is long overdue. p.s Banishing Brodburger to Glassworks does not solve the problem of the NCA’s utter contempt for Canberra and its people.